Does the thought of Oblivion bring you out in the sweats? Once you've faced your fears by looking down, rehydrate yourself at this nearby kiosk. 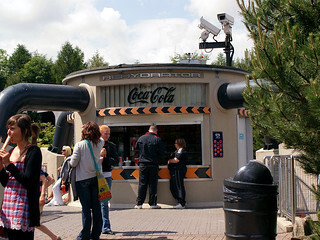 Rehydrator sits in the shadow of Oblivion's drop, serving snacks, sweets and cookies to enjoy whilst watching riders plummet into the pit. The Rehydrator used to have a bar downstairs serving soft and alcoholic drinks, but this was shuttered during the 2015 season. In 2019 the bar was replaced by the Donut Factory.